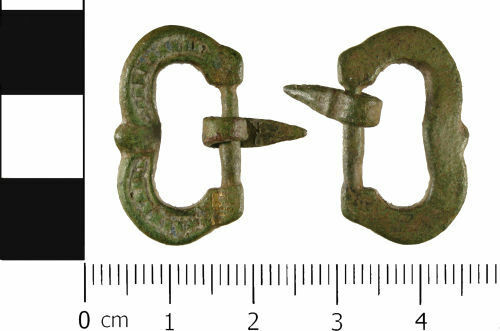 A complete single loop kidney shaped buckle frame and pin, of Late Medieval dating (AD 1450 to AD 1550). The buckle frame and pin are present, the strap plate is missing, presumed lost in antiquity. The buckle frame is kidney shaped with a triangular knop at the centre point, acting as a pin rest. The loops of the buckle frame has been decorated. The decoration consists of a groove to either side, parallel to the edge, and a row of raised squares betweem. The strap bar is offset, and rounded knops are present at either end. The pin has been made from a triangular piece of sheet copper alloy metal, with the wide end wrapped around the strap bar. The buckle frame measures 15.1 mm in length, 25.9 mm wide and 2.2 mm thick. The pin measures12.6 mm in length, 3.7 mm maximum width and 1.5 mm thick. It weighs 3.3 g.
The buckle frame is a dark green colour, with an even surface patina.